I recently completed my TDI Trimix and Advanced Trimix training in Central Florida with instructor Richard Dreher III, from Superior Dive Training (www.superiordivetraining.com). Richard is an excellent instructor, with a great attitude and professionalism. Originally from Minnesota, he now lives in cave country. He is active with the NACD and fully dedicated to cave and tech training. At first, I was a little apprehensive to sign up with a young instructor; I was extremely pleased immediately when I met him in person... It was refreshing to work with a young, knowledgeable and dynamic instructor. He represents the next generation of instructor and I highly recommend him. The first three days of training were dedicated to theory and normoxic trimix (17-21+% O2, in the range of 100-200 ft, 30/30, 21/35, 18/45). The last three days we focused on hypoxic trimix (10-16% O2, 15/55, 13/60, 10/70) with dives in the 180-330 ft range). Anoxic trimix (mixes with less than 10% O2) was outside the scope of this training and better left to explorers. 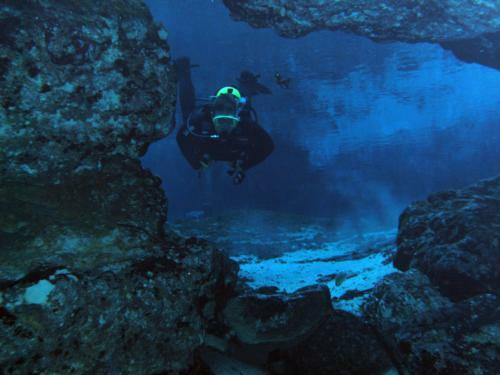 All dives were conducted in caves at Peacock Springs and Eagle’s Nest, so full cave rating was required in order to do the dives. Day 2: The plan for the day was to dive Peacock III / Henley’s Castle (map) @ 180ft, RT of 98min, and Lower Orange Grove (map)@ 160ft, RT of 83min. Both dives on 21/35 bottom mix and deco EAN50 and O2. Another long day (9am-11pm), theory, dive planning, getting fills at Extreme Exposure, gear setup, etc. Nice dinner at Great Outdoors with Richard and Jim chatting about all kinds of ’what-ifs’ scenario from catastrophic equipment failure to the boat cutting loose from the mooring line while in deco. Makes you ponder... We also worked on some skills after our second dive, valve shutdown and breath hold swim. It was interesting to do a 45ft breath hold swim without mask @ 20ft and then being rescued by buddy to complete with an air share ascent without mask. Day 3: Two dives at Eagles Nest (map). 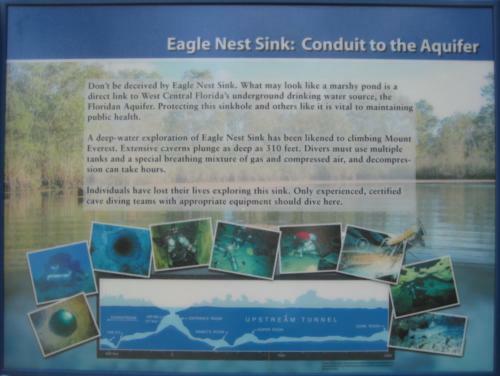 Eagle’s Nest is a pretty impressive cave; it’s a huge sinkhole. Compared to the Black Abyss at Outland (Aktun-Hu), it is darker, colder and definitely not as well decorated... First dive upstream with Jim in the lead and I led the second one downstream. Both dives had similar profile: Drop our O2 bottle at 20-25ft, go to the cave entrance and wait for clock to reach 4 min. Start descent and reach the mound at the bottom, drop travel mix and switch to bottom mix, depart no earlier than 7min. Swim 200-250 ft to a max depth of 200ft, turn around at third or 12 min and start the ascend back at the mound at 19 min to pick up our EAN32 cylinder and start deco. Both dives on 18/45, EAN32 and O2, RT of 50 and 55min, respectively. After the second dive we worked on some final skills: ascent with an unconscious breathing diver and ascent using a lift bag as a buoyancy device. Moving to Advanced Trimix for the next three days. During this portion of the training, I had to demonstrate some more skills and plan and execute four dives, two on Tue, one on Wed and one on Thu. For this class, I borrowed a Liquivision X1 from Wayne at Amigo’s Dive Center in Fort Whyte. This is an amazing little computer with a great user interface, easy to program, switch mixes on the fly, etc. I used it with the V-Planner software with conservatism set to +3. Day 4: We planned our first two dives at Lower Orange Grove - I really like that cave, especially on the way down to the gold line... Richard lead the first dive installing the primary reel and we went to the bottom of the pit at 180ft for a couple of minutes with a total run time of 71 min. On the way out we left the reel in so I could easily find my way in for the second dive which I planned on leading. On the second dive, we checked out the circuit on the left at the first T. I pulled out the reel on the way out. Max depth of 162ft and RT of 55min. Both dives on 19/22 (we topped off yesterday 18/45 tanks with air as we got back too late to get 21/35 fills), EAN32, O2. Before getting out of the water, we did some skills; in particular, a breath hold swim of 66ft (20m) without mask - that’s pretty long... Two great dives and my SAC rate is back down closer to my usual breathing rate. Still on the high side, but on average, I’m in between .5 and .6 swimming with all these cylinders and .4 on deco. Day 5: The objective for the next dive was to visit the Super Room at Eagle’s Nest upstream. This is a 700+ ft penetration with max depth of 270ft, avg 230. Our dive plan was as follows: 0 on EAN32 descent to 20 ft and drop O2 cylinder, switch computer to proper mix, 4 start descend in the entrance tube, switch gas at 110 to 21/35 travel, and go to the mound to drop EAN 32 deco leave at 7, drop 21/35 travel and switch to back gas at 11, swim 8 min down to 260, then back up into the Super Room at 230 ft, turn at 24 min or third. I led the dive in and we turned the dive on schedule at 21 min reaching the end of the Super Room. The RT 113, which included an extra 10 min deco at 10ft. Mixes: 2 HP130 15/55, 1 AL 80 21/35, 1 AL 80 EAN32, 1 AL80 O2. 1 spare AL80 EAN32 on the mound. Day 6: For the final dive of this training, we planned Eagle’s Nest downstream past the pit to a max depth 290+ft, and turning on schedule or third, whichever came first. I led this final (graduation) dive; we turned on schedule at 24min after 750+ ft of penetration from the mound where we dropped our deco stage cylinder. The total RT of 135 min. My oceanic computers showed 286 FSW, but I was in fresh water, which mean about 295 FFW. My other computer (Liquivision) showed 289 FFW. Similar dive plan as the previous day, but this time our bottom mix was 14/57. To conclude this visit to cave country, I had lunch with Wayne on Fri, dropped my drysuit at Gamble and went to see Avatar 3D in Gainesville... Then I got stranded in Orlando due to the snow storm in the northeast. It snowed 24 inches in 24 hours! Taking advantage of the situation, I went to the beach at Canaveral National Seashore hiking nature trails and jogging on the beach until I hit a fence where it says: "Restricted Area - No Trespassing by order of NASA"... after taking a few pictures of the rocket launch towers, I turned around and went back to my car, had dinner and an early night.